SCVHistory.com LW2912 | Bear Canyon-Saugus CCC Camp, 1936. 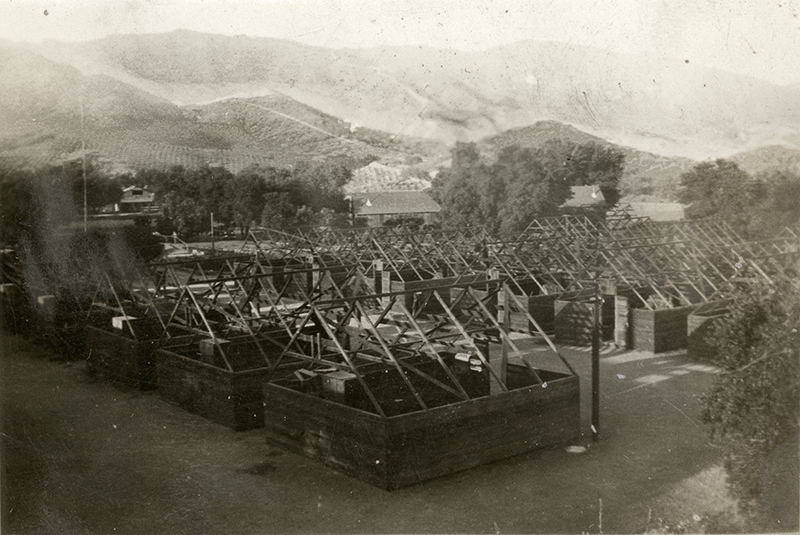 Civilian Conservation Corps (CCC) Camp at Bear Canyon, Saugus. Image digitally enhanced to bring out the mountains in the distance. Handwriting on back of photograph reads: "The last day in Bear Canyon / Saugus, California." Considering that this image shows the framing of tents, it's likely this refers to the photographer's last day at camp, not the final day of the camp. This is probably 1936, since we know the photographer was there in 1935 and 1936. Santa Clara river bed at Lang. Click to enlarge. One in a set of eight tiny, 2x3-inch personal photographs (2.5x3.5 inches, including margins) from an unknown source — apparently a man who was an enrollee with CCC Company 1647 at "Bear Canyon, Saugus" in 1935-36 — and purchased from a third-party vendor who acquired them at a collectibles show in Portland. There is some indication the CCC enrollee traveled between Saugus and Idaho. Camp crews evidently worked on a 3-month rotation; another CCC company that worked at this same Bear Canyon location earlier, in 1933-34, was Company 551. 19 miles NE of Saugus Post Office. Click to enlarge. 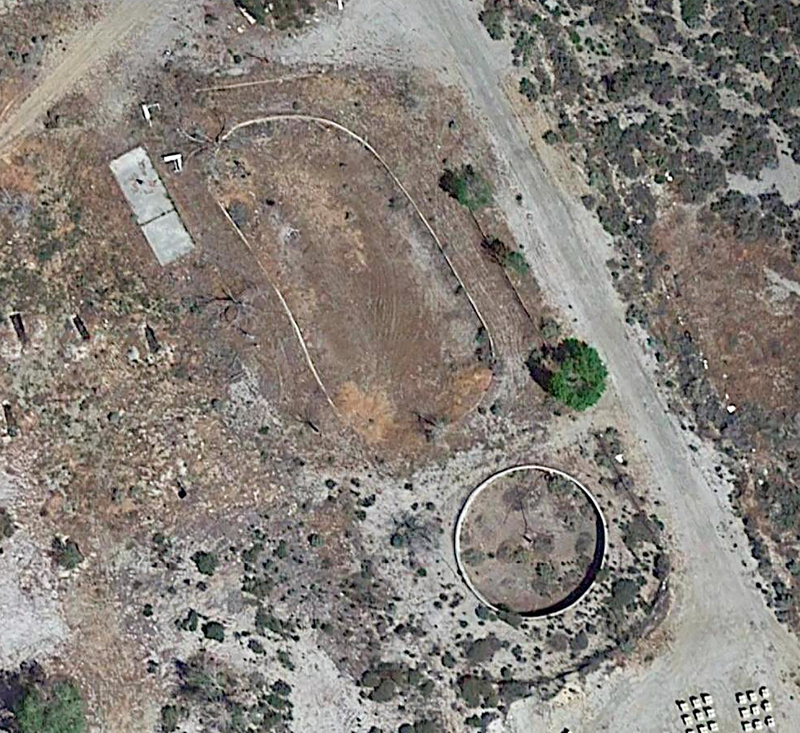 Another possibility is the vicinity of the modern-day Sable (Movie) Ranch at the junction of Placerita and Sand Canyon roads, where there is another Bear Canyon (scroll down to view). We think it might be a good candidate. According to Lynn Baker-Hack, whose grandfather was a CCC enrollee in Company 551 in 1933-34 at the same Bear Canyon depicted here, a photograph in her grandfather's collection shows a road sign to the nearby ranches of Michael Bello and C.H. (G.H.?) Starbuck. Both were in Sand Canyon / Iron Canyon. (Note: This alone doesn't rule out the Lang location.) Another sign points to "Call Fire Box #7." According to CCC Legacy (an association of former CCC enrollees), the Bear Canyon camp was located 19 miles northeast of the Saugus Post Office. At the time, the Saugus Post Office was located inside the general store across the street from the SPRR Saugus depot, near the Saugus Café. There was a CCC camp at that approximate location, north of Agua Dulce in the Sierra Pelona foothills. But the topography doesn't seem to match up with the photos. What does measure up is 36491 Bouquet Canyon Road, where Brett DeMott says: "I remember this place near Spunky Canyon and Bouquet was a boys camp back in the 1970s. The concrete basin is still there. It is exactly 19 miles from The Saugus Café." While some CCC camps simply disappeared, others were reused, such as the CCC camp in Acton, which became a TB camp and later a drug and alcohol rehab facility. Perhaps the camp for wayward boys in the 1970s was a CCC camp in the 1930s. There was a CCC camp somewhere in Bouquet Canyon. 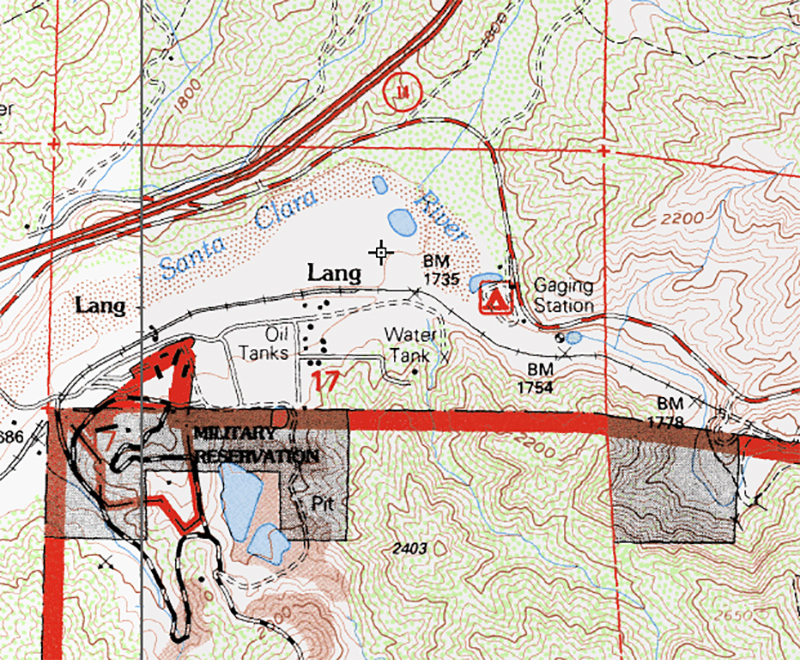 Possible location of Bear Canyon CCC camp, if it was at Lang. Click to enlarge. 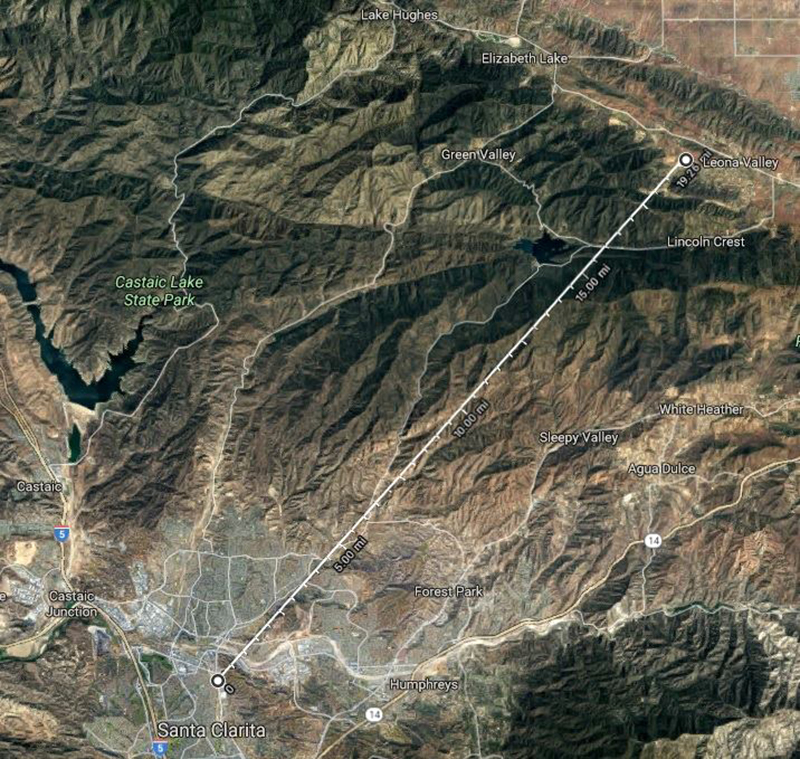 Pin marks the "Bear Canyon" as identified by USGS at coordinates 34.4269401 / -118.3484132 (342537N / 1182054W). Click to enlarge. Sable Ranch area. 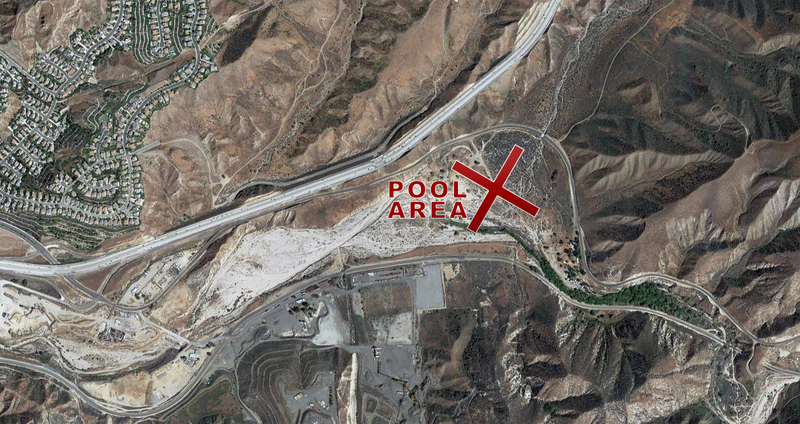 Note the Bear Canyon label (circled) and the outline of a possible pool at bottom-center. Click to enlarge. About the Civilian Conservation Corps. With unemployment at 25 percent in the fourth year of the Great Depression, Congress granted President Franklin D. Roosevelt emergency powers less than a month after he took office. Days later, on April 5, 1933, FDR created the Civilian Conservation Corps by executive order. Considered one of the more popular New Deal programs, its goal was to employ young men to plant trees and arrest the destruction of America's natural resources. By late 1935, more than 2,650 camps were operating in all 48 U.S. states including more than 150 in California. They operated at the direction of different federal and state agencies. Locally, camps were established under U.S. Forest Service control in Acton (which became Acton Rehab), Agua Dulce (north of town in the Sierra Pelona foothills), Oak Flat (Castaic area), Bear Canyon (19 miles northeast of downtown Saugus, per CCC Legacy), Elizabeth Canyon and Bouquet Canyon (per Jerry Reynolds), Mt. Pinos and maybe elsewhere. Most unemployed youth were in the east, while most of the projects were in the west. They earned $30 per month and sent $25 of it home to their families. Nationally from 1933-1942, more than half a million enrollees planted more than 3 billion trees, erected 3,470 fire towers, built 97,000 miles of fire roads, fought fires and floods, performed erosion control, and created parks — including, in California: Big Basin, Mt. Diablo, Mt. Tamalpais, Pfeiffer Big Sur, Cuyamaca Rancho and more. The CCC also rebuilt the La Purísima Mission near Lompoc in one of the country's largest historical restoration projects. Locally, CCC enrollees built fire lookout towers, cut fire roads, fought forest fires, strung telephone lines, replaced washed-out bridges, contoured slopes, built campgrounds in Bouquet Canyon and the Elizabeth Lake area, and even developed wildlife refuges and stocked fish in the Bouquet Reservoir. LW2912: 9600 dpi jpeg from original photograph purchased 2017 by Leon Worden.